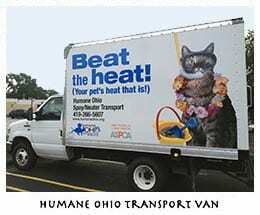 We provide transportation for pets in need of spay/neuter in a temperature controlled box truck to travel to and from Humane Ohio’s spay/neuter clinic. Our van travels within a 60 mile radius (each way) and sets up at a central location to pick up and drop off pets. Our Outreach Coordinator will work with you to help get the word out and fill the transport. This is a great way for us to offer low-cost spay/neuter to communities in outlying areas, and to offer transportation locally to pet parents who might not have access to transportation or whose schedule prevents them from coming to Humane Ohio directly. If you are a business, animal shelter/rescue, community group, or individual who would like to schedule a transport in the Toledo Area or outside, please contact our Transport Coordinator at transport@humaneohio.org. (If you do not have a physical location, we will work with you to find a location in your community to use for transport pick-up and drop-off). 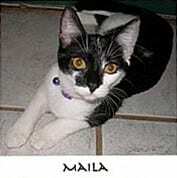 Maila was brought into the shelter alone as a tiny kitten. She was quickly taken into foster care by PAWS of Michigan. She boarded our transport van along with other PAWS animals that needed to be fixed before adoption, made the one hour trip, and was spayed at Humane Ohio.